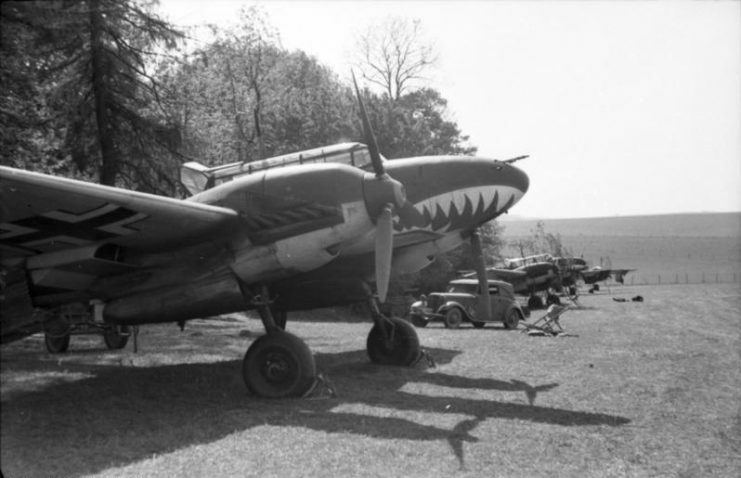 Prior to the beginning of WWII, Hermann Goering was urged by the Third Reich’s Ministry of Aviation to solve the issue of choosing the right design for the multipurpose long-range fighter-bomber which was to be introduced into the Luftwaffe air armada. 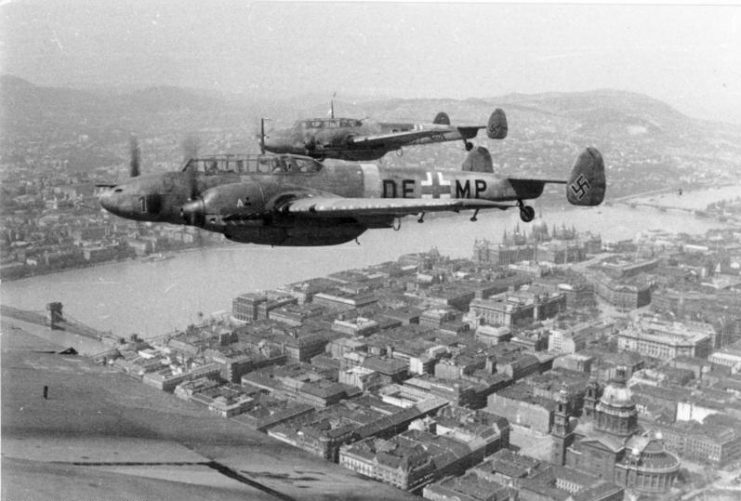 During the 1930s, while many of the major world powers were still making the leap between biplane to monoplane, Germany seemed to be one step ahead. 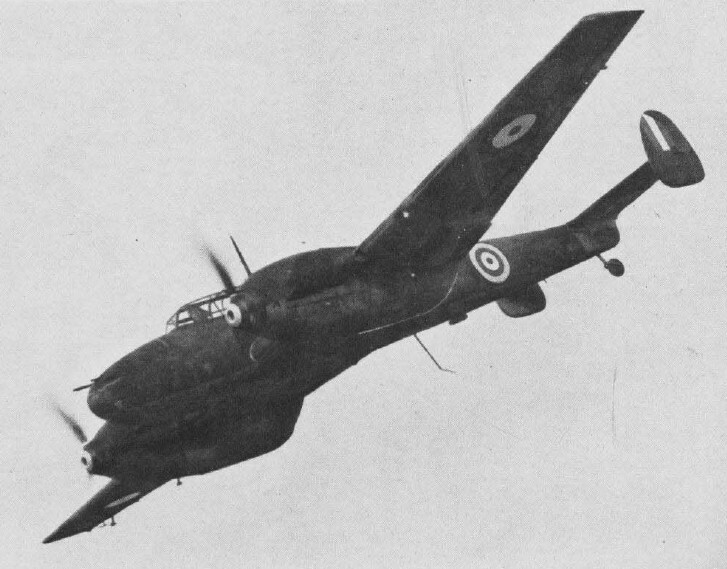 The request from the ministry listed following requirements ― a twin-engine, three-seat, all-metal monoplane, armed with cannon, but also featuring a bomb bay. 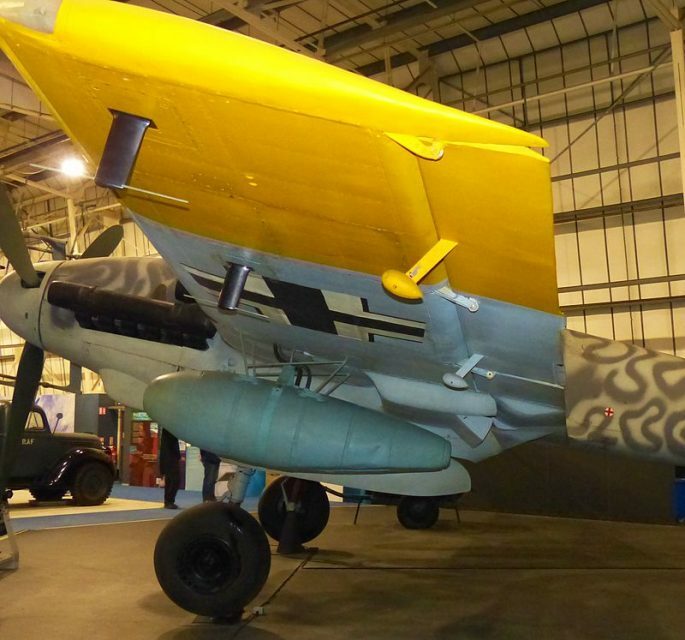 After several design prototypes offered by respectable German aircraft manufacturers, Goering settled on the early variant of what was soon to become the notorious Messerschmitt Bf 110. 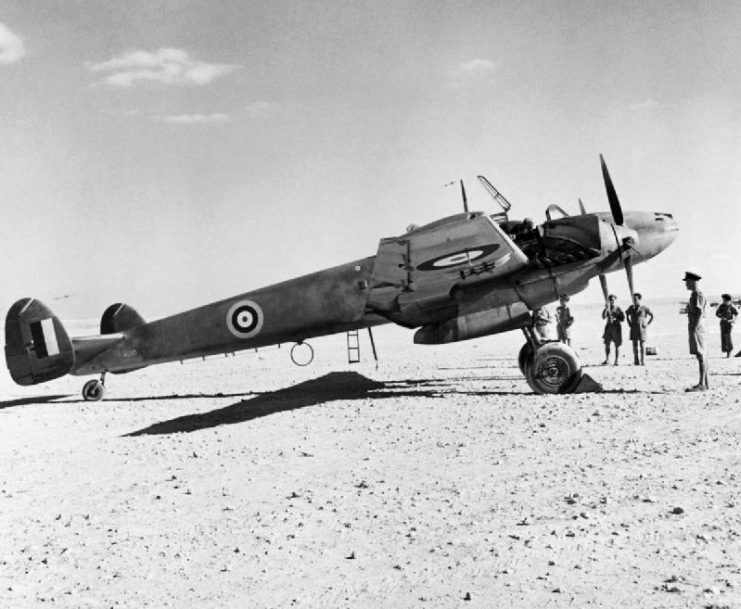 Despite the fact that the early versions introduced in 1937 featured drawbacks concerning engine power and its reliability, by the time the war began, the aircraft’s performance had much improved. 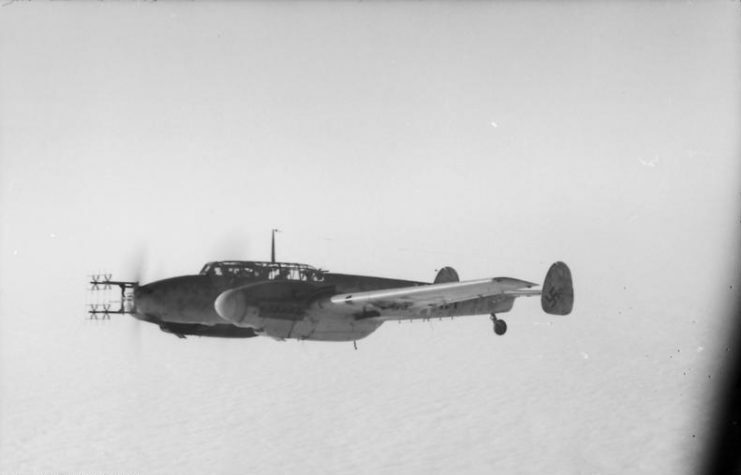 During the first years of the war, the Bf 110’s main armament included two MG FF 20 mm cannons and four 7.92 mm (.312 in) MG 17 machine guns situated in the upper and the lower part of the nose, respectively. 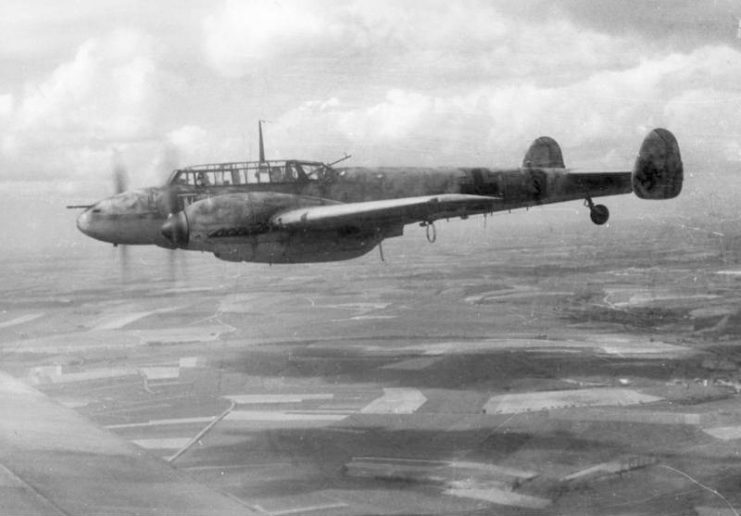 For defense against tailing fighters, the Bf 110 relied on a single MG 15 machine gun, also using 7.92 caliber bullets, or a twin-barrel MG 81Z. 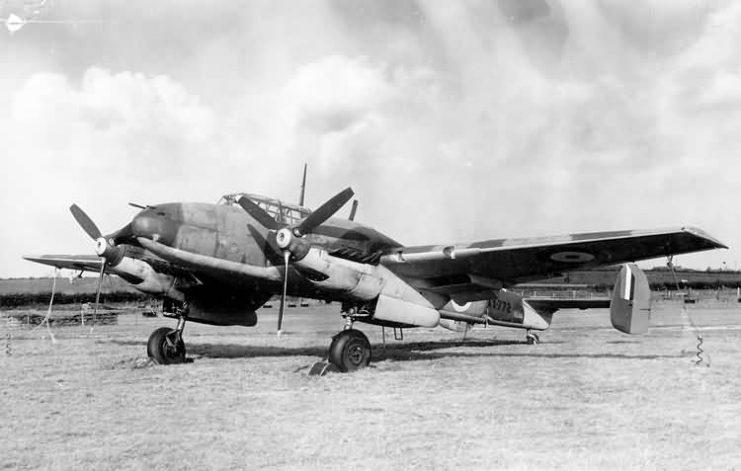 As the war progressed, its air-to-air weaponry was replaced with more powerful 20 mm MG 151/20 cannons, while the models used especially as bomber-destroyers were fitted with two 30 mm (1.18 in) MK 108 cannons which came instead of the MG 17s. 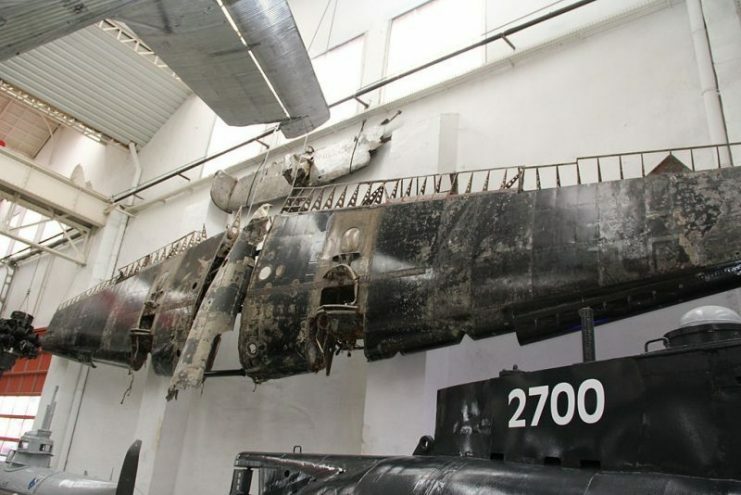 As for the bomb rack under its fuselage, it was able to carry between 1,500 and 2,000 kg of bombs, depending on their type. 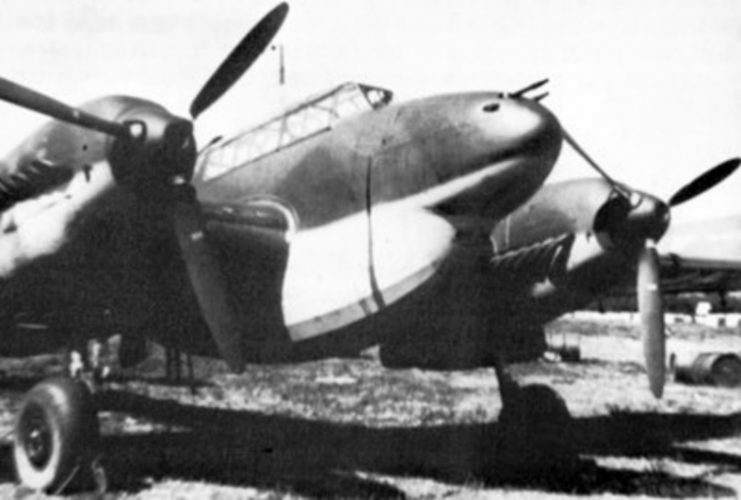 Later the fighter-bomber was installed with a single 37 mm (1.46 in) BK 3,7 auto fed cannon called Bordkanone, which was fitted directly along the fuselage. 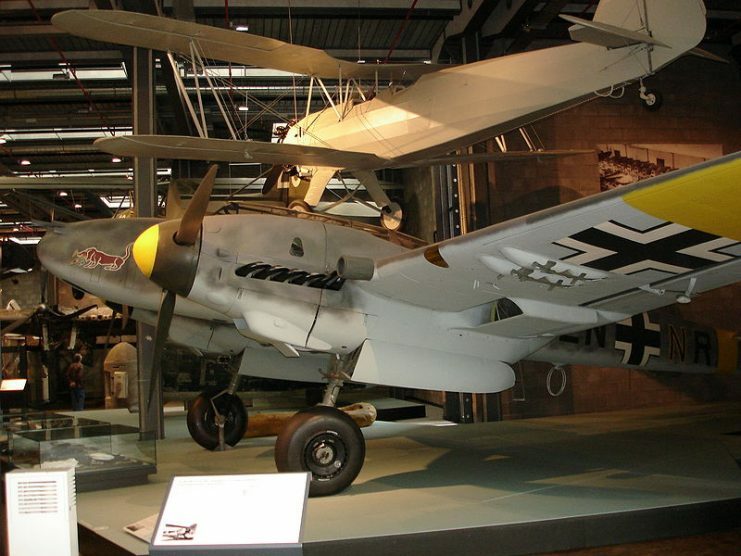 A single shot from this monstrous weapon was able to destroy an Allied bomber. 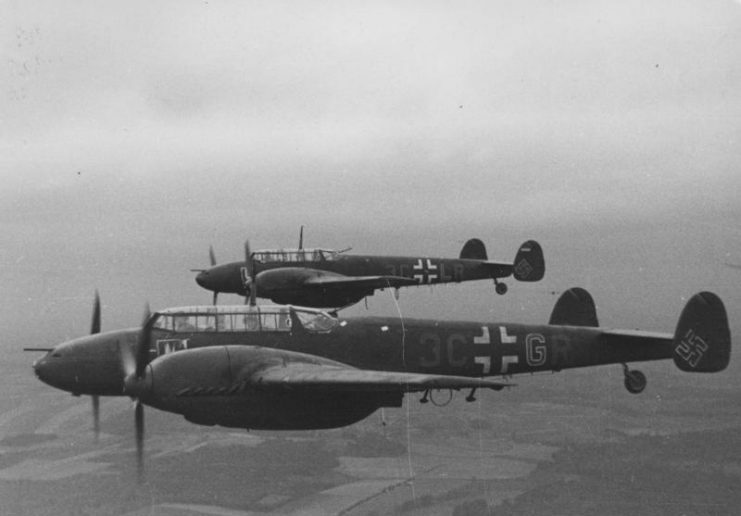 Despite having garnered great success during the sweeping string of German victories in the early stages of the war, the Bf 110 proved to be lacking the agility to face organized resistance by Allied fighters. 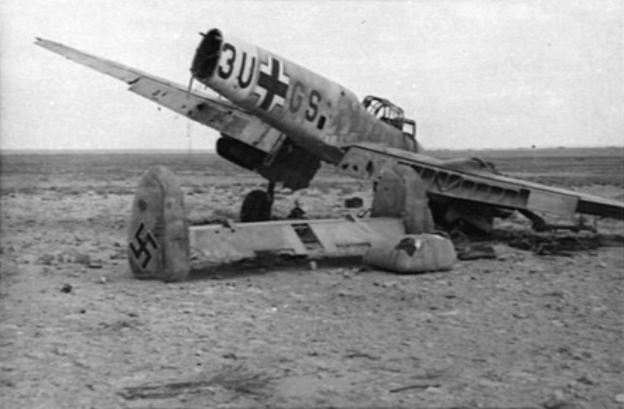 A captured German Messerschmitt Me 110D “The Belle of Berlin” in British markings on a landing ground in North Africa. 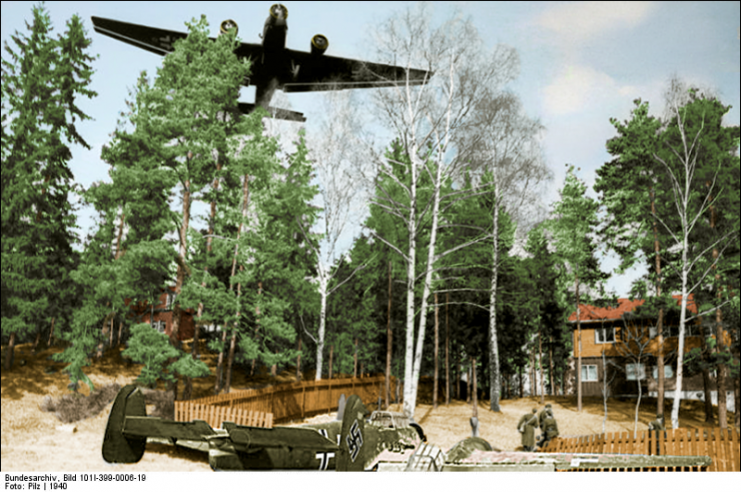 Still, it remained in use and was largely praised as an irreplaceable night fighter by German aces who specialized in night raids, as it formed the backbone of the Nachtjagdgeschwader units throughout the war. 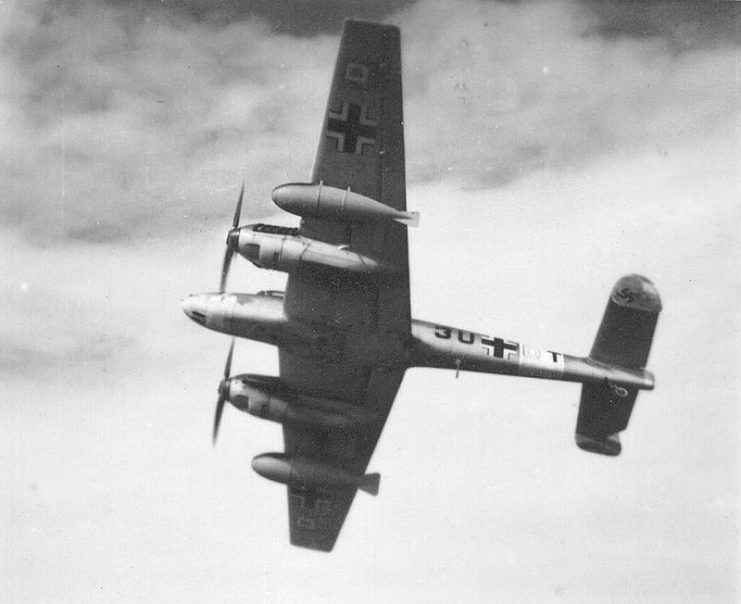 Major Heinz-Wolfgang Schnaufer, the most successful night ace of the Luftwaffe demanded to exclusively fly in a radar-equipped Bf 110 G2 aircraft and claimed 121 victories in 164 combat missions. 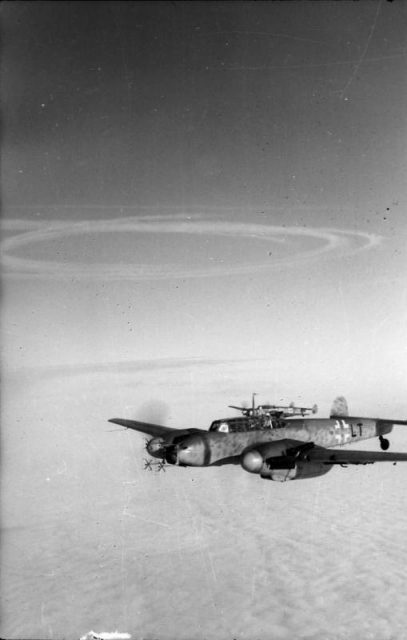 However, by 1944 Allied bombing raids on Germany became more frequent and the Bf 110 was put to defense but was unable to make a difference in times of complete Allied air supremacy. 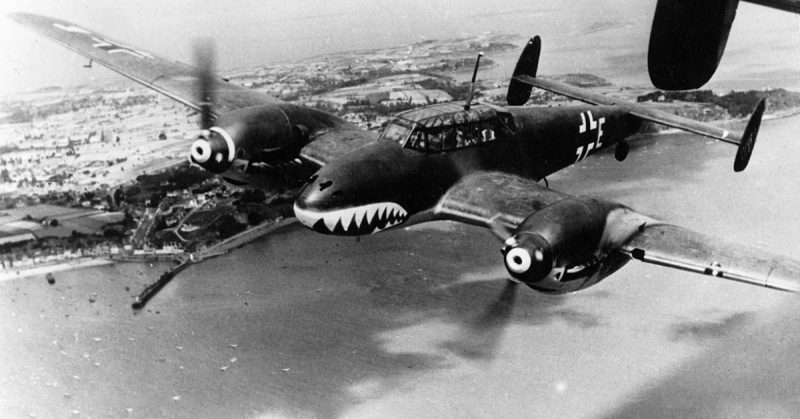 A Messerschmitt Bf 110 C-4 (c n 2177), probably at RAF Duxford in 1941. 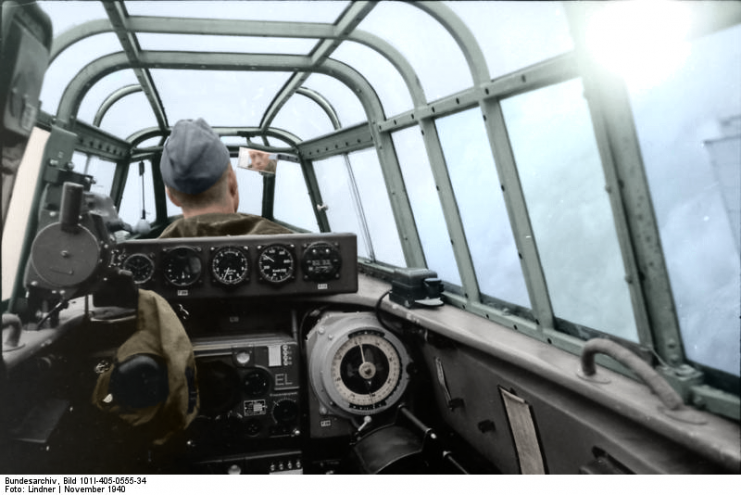 Bf 110 Werk Nr. 5052, Deutsches Technikmuseum Berlin. The noseart emblem on this aircraft is the dachshund of 10. (Z) JG 5. Bf-110 G-4 cockpit; RAF Museum London. 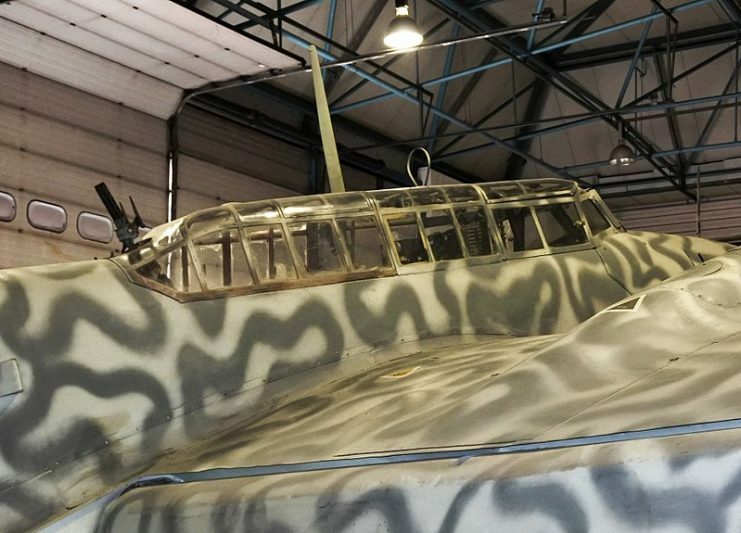 Messerschmitt Bf 110 at Deutsches Technikmuseum in Berlin. 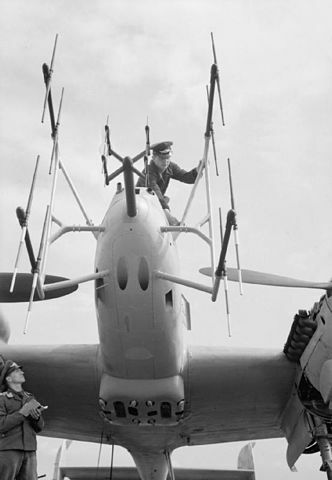 FuG 220 and FuG 202 (centre) “Lichtenstein” SN-2 VHF band, and B/C UHF band night fighter radar antennas on the nose of a Bf 110 G-4 being serviced by Luftwaffe ground crew on Grove airfield, Denmark postwar in August 1945, before the aircraft was sent to the UK for research.